Estuaries are places where rivers meet the ocean ― bays, harbors, lagoons, salt marshes, tidal inlets, barrier islands, and sounds. The estuary is a transition ecosystem between rivers and ocean ― a zone influenced by marine phenomena like tides, waves, and the influx of salt water and riverine phenomena like fresh water flows and sediment transport. 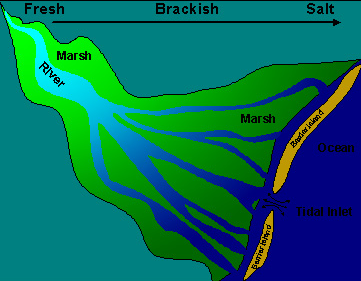 Conceptual Diagram of an Estuary. Estuaries are among the most productive micro-environments on earth with more organic matter created annually than comparably-sized forests, grasslands, or cultivated land. Sheltered estuarine waters support thriving communities of plants and animals especially adapted for this ecosystem. To stand at the edge of the sea, to sense the ebb and flow of the tides, to feel the breath of a mist moving over a great salt marsh, to watch the flight of shore birds that have swept up and down the surf lines of the continents for untold thousands of year, to see the running of the old eels and the young shad to the sea, is to have knowledge of things that are as nearly eternal as any earthly life can be. Estuary of Klamath River in Redwood National Park. Nutrient Cycle - Many elements are recycled in estuaries providing sustenance to living organisms. The health of an estuary depends on a balance of these elements. Water Cycle - Evaporation occurs in estuaries and fresh water recharges ground water reserves. Cycle of Life - Estuaries provide food, shelter, and nurseries for animals. Decomposing animals provide nutrients for other organisms. National Estuaries Day is an annual observation in the US held on the last Saturday of September.